At the CES 2011 Unveiled event, we had a chance to meet with WowWee, the makers of the Cinemin Slice. At first glance, it may appear like just another iPad docking solution, however this gizmo goes above and beyond. The $429 dock features an integrated DLP pico projector and speakers, making it a full entertainment system. 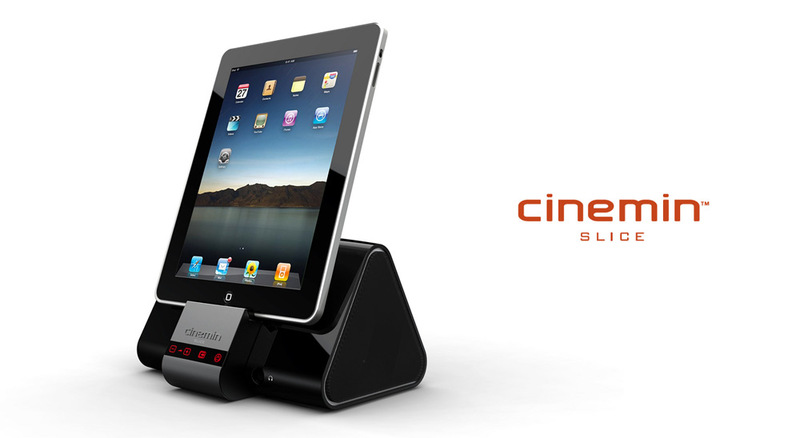 Although clearly marketed toward iPad users, the Cinemin Slice dock is also compatible with the iPhone and iPod Touch. In addition, it also offers mini-HDMI and VGA inputs for those looking to use the projector with other devices. Unfortunately, the dock only projects at a WVGA (854 x480 pixel) resolution when most content is now at least 720p. While our experience with other pico projectors, such as the 3M MPro120, was somewhat disappointing due minimal picture visibility in normally lit rooms, the Slice was impressively bright enough to use on the well-lit show floor. Although we didn’t have enough time to observe image quality in detail, WowWee’s representatives claim that it can project up to 10 feet away with 60-inch diagonal image. Although a bit pricey, for those interested, the Cinemin Slice is now available for pre-order.